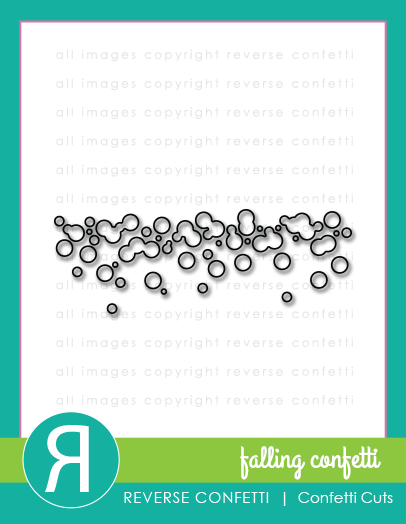 Hey, 'Fetti Fans, welcome to Day 1 of the May Release for Reverse Confetti! This is an extra special release, because we're celebrating Reverse Confetti's 3rd birthday! 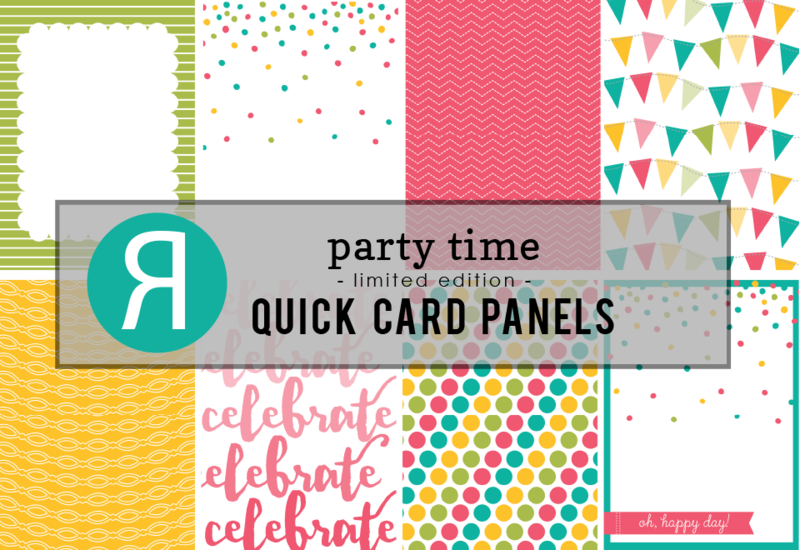 And we have such a fabulous anniversary release, with four new stamp sets and eight new Confetti Cuts! Lots of sweet goodness coming this month! that comes with coordinating Confetti Cuts. 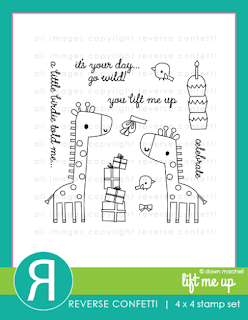 Here's my card, using the adorable Lift Me Up stamp set! 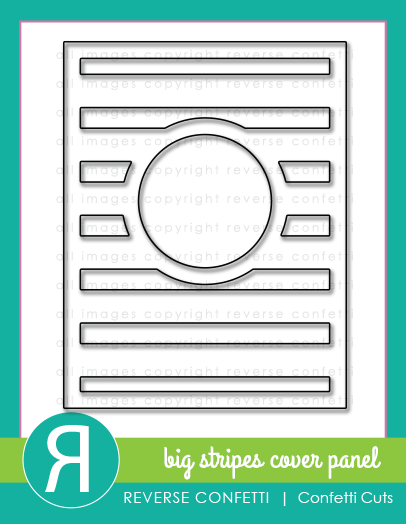 I started by creating a tag from a piece of white cardstock. as well as the "wishes" sentiment from Celebrations. and adhered it to the top of my tag along with some Solid Strawberry Twine. 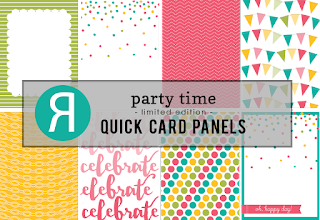 I stamped the "big" (also from Celebrations) onto my card background. Oh, and do you like my diecut word? You'll never guess what I diecut it from -- the packaging from a Reverse Confetti Confetti Cuts. so I diecut my Fancy Words Confetti Cuts from it. 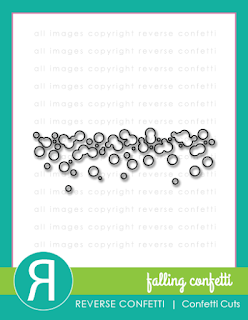 and the new Falling Confetti Confetti Cuts that's being released this month. You have until Thursday, May 12th to link up your card. 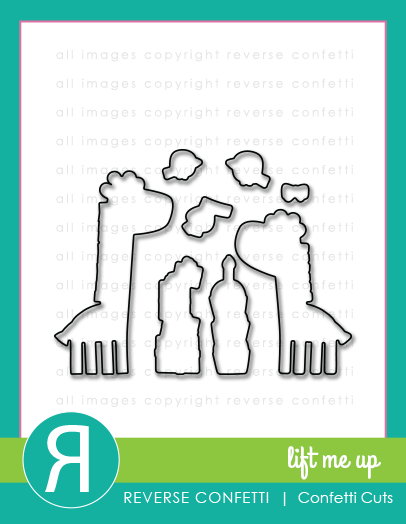 For my next card, I decided to use the Lift Me Up Confetti Cuts along with the stamp set. stamping them in versamark and heat embossing them in white. Then, I used my Zig markers, some water and a paintbrush to colour them ink. I'm really pleased with how they turned out! from a thin piece of white cardstock. I layered this over a piece of watercolour paper and used a blending tool to apply ink to my panel. I finished it off by stamping my sentiment (from Celebrations) in dark chocolate ink. announced later that day at 5pm CST. Want two more chances to win? Oh, wow! Super sweet cards with the giraffes!!! 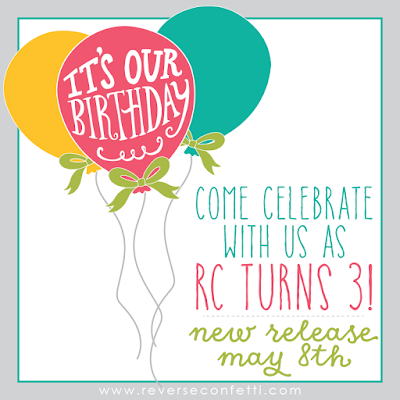 Happy 3rd Birthday, RC!!! Both of your cards are super cute Leigh! Oh, these are such adorable cards, Leigh! I just love this new set, and you used it to perfection! Love the clever stencil you created for the stripes, and love the soft watercoloring. And your sweet tag and multi-colored sentiment die cut are just the happiest things! Your cards are over-the-top cute! What a great idea to diecut packaging! Kind of makes me go "Duh." Beautiful cards, Leigh!! I love the clean look in the first one...and the tag too! The pink background looks awesome!! The giraffes are too adorable!! Love the very different look on these cards! Great inspiration!!! Now I'm off to create something myself! Super duper cute, such fun, love this new release! So cute. I like your coloring. Oh oh oh these are super sweet! Love the new products too! 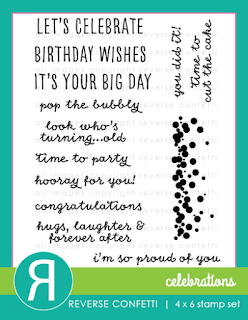 Love the stenciled card! So cute, Leigh! Very cute!!! I love how you did the watercolor designs! So cute! Loving this release so far! Two beautiful cards...... oh, how I love your happy colors and lovely detail! Both of these are very cute, Leigh, I especially love the tag card!!! Cute card and tag!! Love that tag topper!! That collection looked adorable as is but you have convinced me that it is absolutely adorable! Love all the ideas the DT is giving for this fun release. Love how you topped the tag. and the falling dots is wonderful. The second card is so soft and pastel. thanks for sharing two great cards. What lovely cards and lovely designs. I just love the background and like how you stenciled it. The tag card is so, so sweet. Thank you Love your ideas. 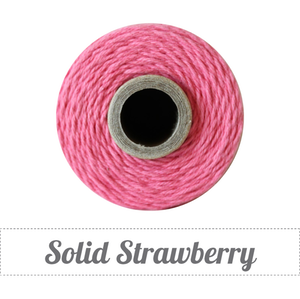 I love the color choices of your cards - so fresh and springlike. Great clean style on your adorable cards. Like the way you made the two-toned sentiment on the first one, too. Adorable! I love your cards! The pink is so cheery. This card makes me SMILE! Congrats Reverse Confetti! Those giraffes are CUTE! I love the two toned sentiment on the first card! Those little giraffe's are so adorable, especially in pink! These cards are really sweet, Leigh! I love the pretty color, and especially that white on white tag idea! Fun! 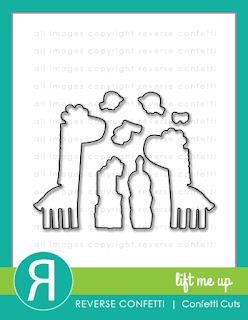 Your die cut sentiment rocks! Love your designs and your showcase of all the new items. Both cards are just adorable. What an ingenious die-cut on your first card. Clever girl. I'd never have thought of doing that, but now will be looking for good candidates for that technique! Love your festive card, Leigh! The giraffe is so adorable! Leigh! these are the sweetest cards ever! I love how you did a two-tone on birthday in your first card! : ) Really precious . This set just screams cuteness! That giraffe is TO CUTE! super sweet set of cards!! Both of the cards are so cute! Love your cards!! I have to get the tag toppers!! I love the cover plate so much too.!! Happy Birthday RC!! Your Watercolors are fantastic.....love the adorable giraffes. Then you give a hint about the Falling Confetti and the Celebrations stamps. We'll stay tuned for tomorrow's projects! These are both just as cute as can be Joyce!! Darling cards. Love the look of the tag topper. Darling cards. Love how you used the striped panel as a stencil - great idea! Such cute cards! I really like the pink strips in the background of the second card. Great cards. Love the watercoloring. Those giraffes are adorable. So many things to like about each card, that I can't even list them all. (But here are a couple.) 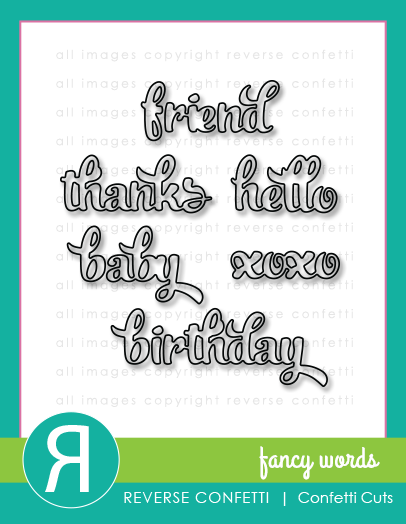 Love the Quick Panel tag topper banners and your "dipped" birthday sentiment. Really cute. Very cute card designs. My fave is the one with the tag. I love both your cards. Those giraffes and birdies are just so adorable! I also love the tag toppers. 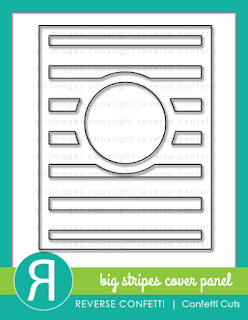 Love how you used the stripe panel background as a stencil! You used so many new products here Leigh, super cute! Your ideas are super! 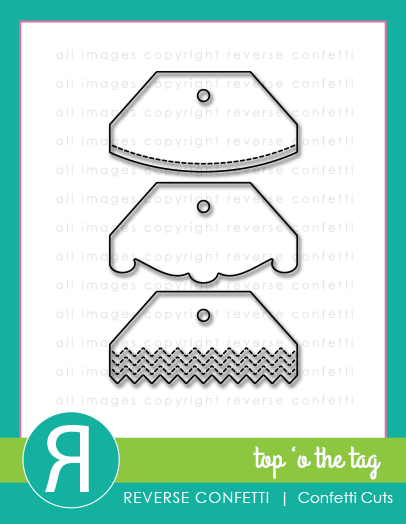 Loved what you did with the tag topper, cutting the top from one of the collection this month! These giraffe's are just dreamy!!! These cards are so sweet!! Love! Love the use of a tag on the card! Wonderful and creative cards...really liked the great recycled packaging for the diecut. Darling cards! Love the sweet giraffes! Great coloring and details on your cards! I am in trouble... I want it all! Wow! Great sneak peek! I love the Giraffes and the cards!!! Awesome cards!!!! 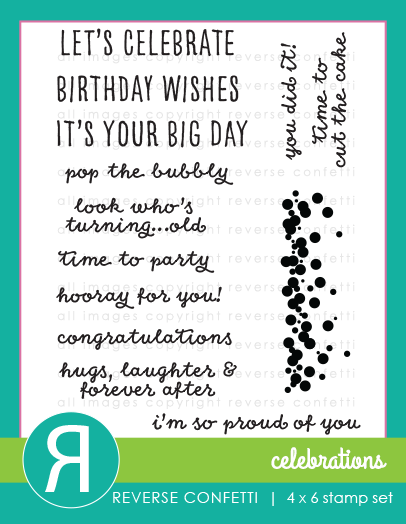 Love the 2-tone of the sentiment in the first card - it really pops! LOVE the white embossing along with watercoloring of images in your second card - so soft and stunning! I must try that technique! Both cards are super cute! Love that sketch layout! These cards are adorable!!! I love your super sweet giraffes! And that tag is fantastic! Love the topper shape on it!